I didn’t feel like going to the store. It was getting cold outside. I knew my supplies were getting low, just some bits of things here and there. Here’s how the dialog goes in my head at these moments. Sound familiar? “Got some of that great chicken stock left in the freezer, so some soup, perhaps? What’s left from the CSA and other dishes this week…hmmm, 2 smallish heads of broccoli. Okay, that would only make a very thin broccoli soup…oh, got cheddar, but it would take a lot of cheese and I want this to be healthy. Let’s see….carrots, celery, onion, thyme, a lemon…sounds good so far…a few cloves of garlic…oh, and a box of baby spinach…and some unopened buttermilk…interesting. Let’s see what I can stir up with this.” So of course I then run to the internet, find a soup recipe that sounds inspiring and go for it, with some add-ins and embellishments. The result? A Lean, Mean and Green Soup. It was delightful… fresh and healthy, but still very rich tasting and flavorful with all of the veggies shining through. And best of all, comforting. And the color…oh my, St. Patrick’s Day, here we come! I wish I’d made a double batch, but I’ll keep that in mind for next time. The recipe below was adapted from Michael Chiarello’s Very Green Broccoli Soup, and you can find his original recipe by clicking right here. We still got our cheese fix by grating a little extra sharp cheddar and making cheese toast under the broiler to go along with. Yum! Cut all the broccoli florets from the stems and stalk and set aside. Peel the tough outer skin of the stalk with a vegetable peeler and trim off the fibrous ends. Cut the stems lengthwise into about 1/2 inch slices, then cut crosswise into 1/2 inch pieces. Heat the olive oil and butter in a small stock pot over medium heat and add the garlic. Saute until the garlic begins to lightly brown, then add the onion, celery and carrot. Add a pinch of salt and some pepper, and cook the vegetables until tender, stirring frequently, about 10 minutes. Add the thyme leaves and stir, then add the broccoli stems, the stock and a bit more salt and pepper. Bring to a boil, then reduce the heat to a simmer and cook uncovered for 3 minutes. Add the broccoli florets, and half of the buttermilk, and bring back to a simmer. Cook for 5 minutes, or until the broccoli florets and the stems are nice and tender, but not mealy. Remove the pot from the heat and puree, using a stick blender and adding half the spinach, half the zest and half the nutmeg in two batches, pureeing in between. When the soup is smooth, return it to low heat, add the remaining buttermilk, stir and bring it just to a gentle simmer. Season to taste with salt and pepper. Garnish with a small dollop of yogurt and a little fresh thyme if desired. March is #greenslove month! Check out the blog hop and join in the fun by following this link back to Linda at Savoring Every Bite, to see more great recipes featuring greens and to follow on twitter! This entry was posted in Food, Soups and tagged Broccoli, Broccoli Spinach Soup, Buttermilk, CSA, greens, Greenslove Month, Healthy Soups, Spinach, Vegetarian by bitsandbreadcrumbs. Bookmark the permalink. Lover of the greens – asparagus last night for dinner and salad for lunch today:) Thanks for sharing! I love asparagus, too, and can’t wait until it’s in season here. Greens are so good, aren’t they? Thanks for your comments! This I must try soon. It looks sooo healthy! It is healthy, and so tasty, too. Hope you will try it Tia! I could almost make this soup from what I have in the fridge, but, alas, I have no broccoli. Sounds good. Hi Sharyn, I think you could make this with all spinach, but would add more to compensate for what I have here in broccoli, and maybe up the seasonings a bit. Love the beautiful green color of your soup, so healthy looking and bet very delicious. Thank you, Norma. It is very delicious and a surprising balance, at least to me, between the broccoli and the spinach. Betsy, your very bright post and new masthead have cheered me up on this rather bland Monday. Hopefully the soup is more lean than mean…..but hey I’m sure this soup can’t hurt me? 🙂 I could really see the ponytails liking this soup, so I’m going to tuck it away for St. Patrick’s day. Great idea! Hi Barb! I’m so glad that my post and the new masthead have cheered you today…they did me, too! The “mean” part is just for grins of course, a lean mean antioxidant rich machine, this soup is. 🙂 Guess maybe I should clarify that in the caption! It can sometimes get tricky kitchen with our CSA as well, but another great job of coming up with something delish to enjoy! Thank you, Big Hungry Gnomes….love your name! Broccoli and stilton sounds wonderful and broccoli and cheese was my first thought, but I didn’t have as much broccoli as I felt I needed to make a broccoli-centric soup and stand up to the cheese. I think you’ll like this version if you try it, and indeed it is a spring-y soup! This would be perfect for St. Patrick’s Day! It sounds delicious. This is so bright and fresh looking! I bet it is as delicious as it is gorgeous! Thank you…it was delicious and I will definitely make it again! That’s a whole lotta green, Betsy! There’s so much to love about this soup that the fact that it’s so good for you is almost lost. Isn’t it great when a rummage through the fridge results in something as delicious as this soup? Well done! It is a lot of green…I just decided to go with that in shooting it and added more! Thanks for the compliments, John, and you’re so right in that the taste of the soup stands alone, so you forget about the good for you part, really. And I agree, I love rummaging and coming up with something that I love to make, eat and that uses up my ingredients rather than them going to the compost. It’s so satisfying and a win-win! I’ve become more of a fan of blended soups now that I have a Magic Bullet that can puree everything together. This looks delicious and very green! I’m with you on the blended soups revisit, yummy, and thanks! I used my new orange stick blender on this and it was so easy…now I just want to run around blending things! Ha, ha, ha…love it! Thank you Tanya…I needed that chuckle! Hey Carol! Thank you, I’m so glad you like the masthead…I needed a fresh look. We’re hanging in, just riding the trough to get to the next wave! If it helps any, I don’t think the spinach flavor is very pronounced in this, even though I upped it a lot from the original recipe. You could definitely do more broccoli and just a bit of spinach, use cream instead of buttermilk…all those things Michael did and I know it would be good. I think there’s some room for flexibility in this soup! I love how you came up with this delicious soup!! Michael is one of my favorites and I got excited when I saw his recipe gave you a good base to work from!! The color is stunning too! I’m glad you shared in the bloghop! Thanks for the shout out! I actually believe I have all the ingredients to make this too!! I wish I have a blender so I can puree my soups too. Thanks for being part of our #greenslove blog hop! Hi Richgail…thanks for visiting! I love greens and always have some on hand, so it was fun to participate in the blog hop. I highly recommend a stick blender…they are so handy! Simply stunning. Love the photo and the recipe. OK, I don’t know who you paid at WordPress, but this has been atop my subscription list for days. The new ones come in under it. It’s torture. The soup keeps calling to me! LOL, I don’t know why or how that’s happening, but it’s the same way on my reader…I thought it was just happening to me since it was my post! My reader has also started giving me every comment from other blogs I comment on, even though I haven’t clicked any buttons. Weird. Sorry for the torture…I’m actually kinda tired of looking at the soup there myself! Thank you, Kay! I love broccoli, too, and gravitate towards any recipe that uses it, plus I just love it by itself. It’s so good for you! What a gorgeous soup, Betsy; I do love Michael Chiarello, I haven’t seen him on TV for quite some time; I’m guessing Food Network Canada just stopped carrying his show, it’s too bad, he had such a nice way about him. Hi Eva…the last time I saw Michael Chiarello on TV he was on the Next Iron Chef series. I’m not a fan of those reality type shows, but got sucked in because some of my favorite older chefs were competing. I don’t know if he has a show on here, either, at the moment. Glad you like the soup…it did turn out a great color I thought, as well as tasty. That soup is a really refreshing healthy looking colour. How great of you to cook up such a nutritious meal from bits and pieces leftover in your fridge! I’m impressed. Well, isn’t this just perfect for St. Patrick’s Day? I love the rich color and the swirl of white is almost too perfect to be true:) Looks like a professional did your food styling today:) AND I love your new Header!! I so could have done with a bowl of this last week at my conferences tapas is great but after 4 days of mostly carbs and meat, I was craving a veg transfusion! This would have been perfect, and I love the colour! Thank you Noodle. Wish I could have sent some of this your way. It’s pretty easy to make, so hope you’ll give it a try! I love soup – I can’t wait for spring to get underway proper here. They have big baskets of greens in the markets, though you need to make sure you’re there early else they sell out! Looking forward to making things like this – it looks yummy, I really like the earthy flavour of spinach in soups! I’m with you, Charles…I love spinach in soup and it’s a great addition and filler for so many things, not to mention how much I like it raw in a salad. This would make a nice spring soup, even though for our season it was made with “winter” vegetables. I wonder how it would be with asparagus instead of broccoli…hmmmm? Thanks for your compliments, Charles and have a great day! If that bowl of green goodness doesn’t say spring, I don’t know what does. That soup is kind of like spring in a bowl, isn’t it? Thanks Karen! This broccoli spinach soup looks sooooo good! I must try this soon. Glad you shared some #greenslove with us! Thanks so much, Elizabeth! I love greens and try to get them into anything and everything during their season. wow, i love veggie soups. spinach and broccoli go well together too. love how it looks thick and creamy! welcome to our #greenslove! Thank you, Juniakk…it was fun to participate and I hope I can contribute more this month. So glad you like the soup! 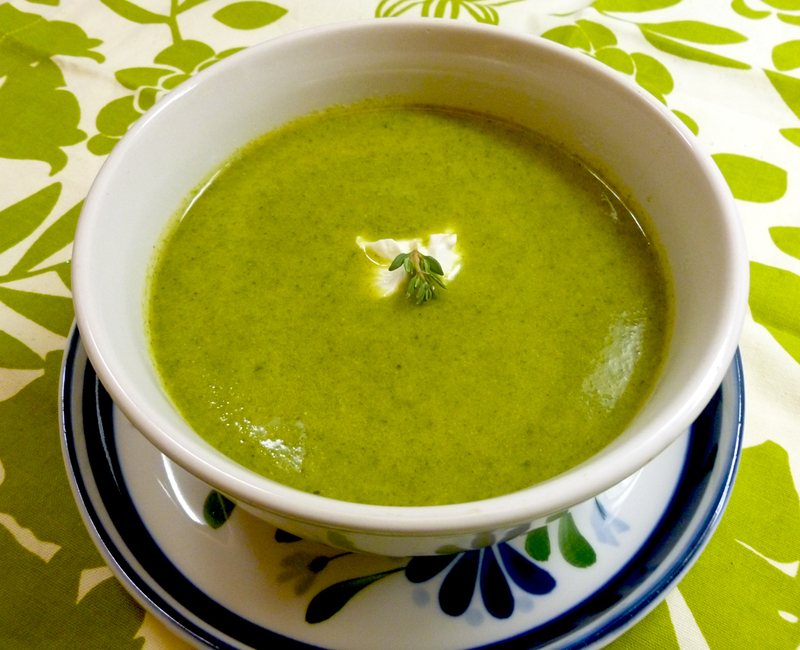 Flavourefull green soup full of health benefits! I like your recipe, u have added lemon zest which will give it all a nice dimension to the soup. usualy I avoid spinach and broccoli, I know I know its healthy food but I dont like the plain weird taste. BUT I can imagine myself enjoying the flavoures u have added to this dish. thanks for sharing! Hi Helene, thanks for visiting. I think you’d really like this soup…it has a clean, but rich taste! Hi Julie, you could try adding more or all spinach…but as it is, this doesn’t taste overly of broccoli…it’s more of a textural thing, if that makes sense! what a gorgeous looking soup! Thank you, Jen. It’s really tasty and I plan to make it again pretty soon. It’s a happy soup!